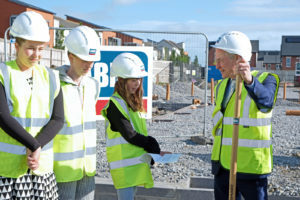 There was great excitement this week in Belmayne when Richard Bruton visited the new school site where Belmayne Educate Together will receive a state of the art new school, housing over 450 pupils. 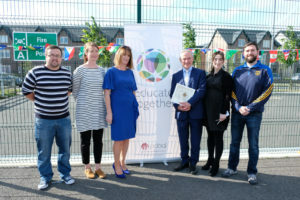 The Minister was welcomed to the site by Principal Sinead O Meara. 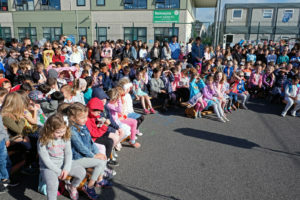 Robyn Mc Cormack, the School President, addressed the Minister telling him her hopes and dreams for the students who will move to the new school premises. 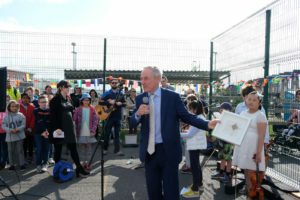 The Minister formally turned the sod along with the Student Council and returned to be part of the school assembly. 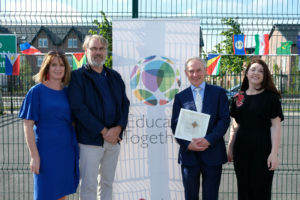 He was presented with a traditional Irish Cross made by students during Biodiversity Week , known as Súil Dé, by the Student Council. This symbol was an old Irish tradition found above the door of houses in the hope that it would protect the family and house from harm. 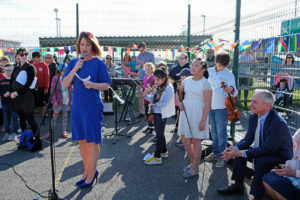 The assembly finished with a rendition of an Irish blessing along with the school choir and children playing violins funded through the DEIS and SCP Programme. 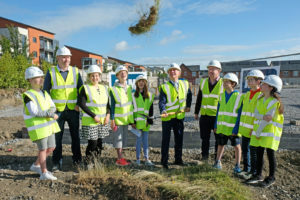 The expected completion of the programme is the end of February 2019 and is being led by ABM design. 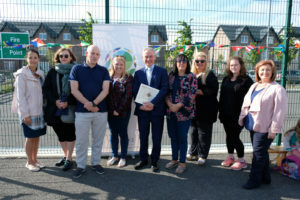 At the turning of the sod ceremony were Sinead O Meara Principal, Gerry Mc Kevitt Educate Together, Carol Norton Chairperson, Jacinta O Toole Chairperson Parent Council, Melissa Mc Cormack who was involved in the initial set up of BETNS, School President Robyn Mc Cormack and members of the Student Council.